After conquering the world of football, it appears Brazilian ace Neymar Jr. is looking to do the same in the comic book world. The Paris Saint-Germain forward has launched a comic book series called "Inked: Art Animates Life" which features a supernaturally tattooed character Junior, drawn in the player's likeness, as the protagonist of the story. The 26-year-old announced the launch of the first issue of the comic series on Instagram this week. The post, accompanied by a picture of the forward posing with the cover art of the graphic novel, said, "Dream come true! Get the first issue of Inked at http://neymarjrcomics.com." The plot follows the hero Junior as he uses his magical tattoos, whose ink brings his body art to life, to help save his sister who has been kidnapped by a criminal cartel with occult ties. 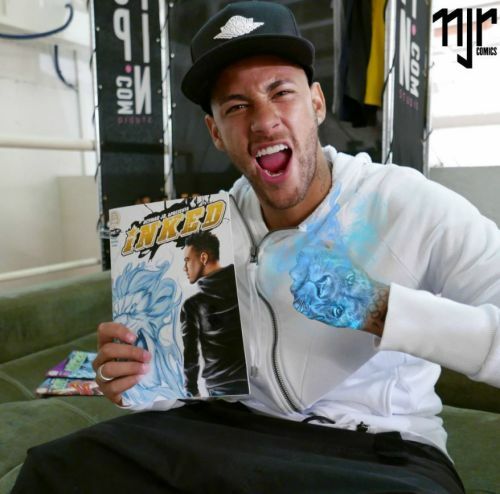 The comic has not been written or illustrated by Neymar but only has his likeness being used. The series is set to debut in Portuguese, Spanish, French and English and will be distributed digitally. One can download the comics from the company’s website. Neymar added, "This unique digital distribution platform will publish simultaneously in multiple languages." “As a kid who grew up reading comics, I hope that these stories and characters can inspire and entertain people around the world." A portion of the proceeds from the sale of the comics will go to Neymar’s charitable organisation called Instituto Neymar Jr.
Is the character named Floppy?